The What: NEC Display Solutions of America has launched the NP-PA653UL and NP-PA803UL installation projectors, the world’s first filter-free LCD laser projectors, according to the company. The What Else: The projectors’ laser light sources and sealed optical engines prevent the accumulation of dust particles and give users 20,000 hours of maintenance-free performance. NEC Display’s filter-less operation allows for less projector downtime and fewer service repairs, so users can maximize their technology investments and the applications available to them. 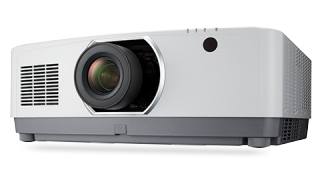 The PA Series WUXGA projectors also feature improved picture processing capabilities with NEC’s unique Scaler Chip, which manages a 4K/60p input and shares signal output with multi daisy-chained connected projectors. They feature Rec2020 color conversion for clear, readable images, as well as image noise reduction, de-interlacing, scaling, and full 10-bit color processing for better overall viewing experience, and up to 8,000:1 contrast ratio. They have a variety of inputs and outputs, including dual HDMI, DisplayPort with HDCP, and HDBaseT with HDCP. They accommodate flexible installation options with 360-degree positioning support in any direction, and interchangeable lenses (NP40ZL, NP41ZL and NP42ZL) with NP-PA653U, NP-PA803U, NP-PA853W, and NP-PA903X projectors, as well as motorized zoom and focus. The Bottom Line: Delivering 6,500 lumens and 8,000 lumens of brightness, respectively, the PA Series projectors give schools, museums, corporations, retailers and other organizations clear, readable images, and high, consistent light output. The NP-PA653UL projector will be available in April 2017 at a minimum advertised price of $7,779, and the NP-PA803UL projector will be available in August 2017. Both projectors ship with a three-year limited parts and labor warranty.